Lobectomy with systemic lymph node dissection remains the mainstay of surgical treatment of non-small cell lung cancer. 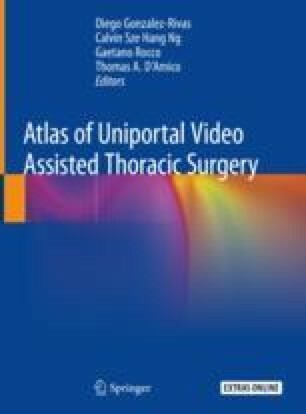 The emerging technique of uniportal video-assisted thoracic surgery (VATS) major lung resection may be a promising candidate for a VATS technique with less intercostal pain, a better postoperative course, and comparable oncologic outcomes to conventional VATS lobectomy. This chapter presents the technical details of uniportal VATS resection, specific for lower lobe lesions. Various individual approaches will be determined by the surgeon’s experience. The online version of this chapter ( https://doi.org/10.1007/978-981-13-2604-2_18) contains supplementary material, which is available to authorized users.